Needing only a Small Order of Custom Stones? 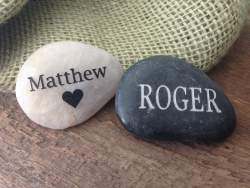 We heard you asking, and are excited to offer several of our engraved rocks in smaller orders. This is ideal for personal use, small businesses, youth groups, memorials and more. Choose from a selection of river stones, sea glass and other custom and engraved products when you need 30, 50 or 80 rocks. Several pieces can be purchased with a minimum order of only 25 stones. In a hurry? Check out our “Quick Ship” section for products that are typically ready to ship within just one business day.